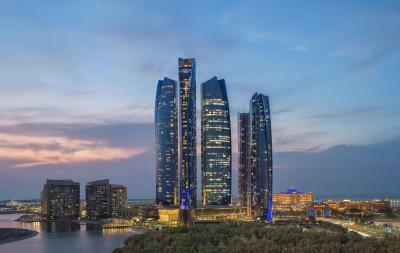 Lock in a great price for Jumeirah at Etihad Towers Hotel – rated 9.2 by recent guests! The property is beautiful as are the views from the hotel. Sitting in the lobby is so relaxing because of the view. The room was super spacious. Excellent customer service from the time you check-in to the time you check-out. Very clean facilities, and comfortable bedding. Excellent facility, clean, luxury , free valet parking, excellent helpful staff, great breakfast. Amazing luxurious hotel, helpful and incredible staff. The concierge service was outstanding!!! Help us prepare and organize all scheduled excursions. Bar lounge on topamazing view and great drinks and food. Everything. The hotel was incredibly beautiful. The rooms are beautiful the views are wonderful. The service was Impeccable!!! You would not want for anything. They aim to please at all times. This is a luxurious hotel - breathtaking lobby, large rooms and great service. Lovely breakfast. 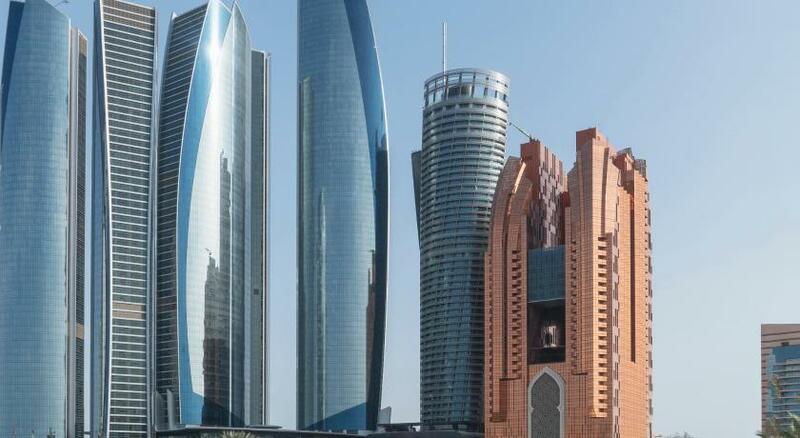 Jumeirah at Etihad Towers Hotel This rating is a reflection of how the property compares to the industry standard when it comes to price, facilities and services available. It's based on a self-evaluation by the property. Use this rating to help choose your stay! 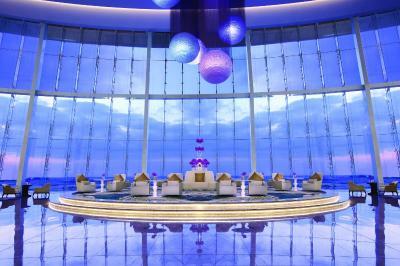 The Jumeirah has a full-service spa with 13 treatment rooms, and a large fitness center with modern equipment. Located on level 74, the Observation Deck is the highest vantage point of Abu Dhabi. 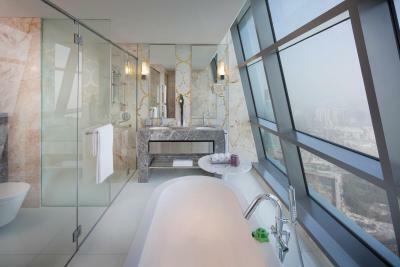 When would you like to stay at Jumeirah at Etihad Towers Hotel? This room has suitably low wardrobes which are easily reachable as well as a spacious bathroom without a tub, a wheelchair accessible shower and safety bars. It includes free entry to Observation Deck. This room includes a seating area with a flat-screen TV and DVD player and a mini-bar. It includes free entry to Observation Deck. Featuring floor-to-ceiling windows, it offers a spacious bathroom with a walk-in shower. It provides views of the city skyline, or the coastline of Abu Dhabi. It includes free entry to Observation Deck. With floor-to-ceiling windows, this room has a large working desk and a spacious bathroom with a walk-in shower. 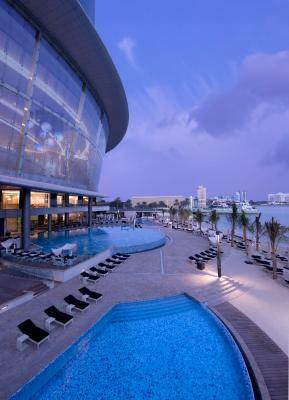 It offers views of the city skyline or the coastline of Abu Dhabi. It includes free entry to Observation Deck. Between levels 48 and 59, this room offers access to the Club Executive Lounge with breakfast, light snacks, hors d’oeuvres and beverages. It includes free entry to Observation Deck. Children under 12 years old are welcome at the Club Executive Lounge between 07:00 and 12:00. Between levels 48 and 59, this room provides access to the Club Executive Lounge with breakfast, light snacks, hors d’oeuvres and beverages. It includes free entry to Observation Deck. Between level 48 and 59, this room offers access to the Club Executive Lounge with breakfast, light snacks, hors d’oeuvres and beverages. It includes free entry to Observation Deck. - Free entry to Observation Deck. 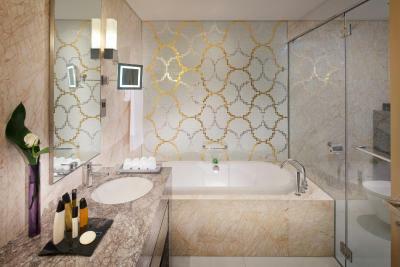 House Rules Jumeirah at Etihad Towers Hotel takes special requests – add in the next step! Jumeirah at Etihad Towers Hotel accepts these cards and reserves the right to temporarily hold an amount prior to arrival. The facilities were very good and the selection of restaurants. Liked everything. From staff, room, location, cost everything was fantastic. Surcharges within the restaurants were quite excessive. The Japanese Restaurant, we chose dishes without surcharges and the portions were poor, i left feeling hungry! Service at the hotel was incredible, very attentive! The facilities were amazing, everything was very luxurious and spotlessly clean. For my kids there was not any club or activity . Only pool and beach which nothing to keep them happy or fun.in the morning also after breakfast they swimming for one hour then felt cold and board . Please only with very low cost to make one room as kids club and let kids play together and one staff to sing with them play or painting or watch movie any entertainment pertaining for kids make huge profits for hire and huge happiness for kids and parents. The kids club is totally inactive..
We enjoyed the scenery fron the 55th floor. Clean, comfy and tasteful stay. It’s minor, but communication with room service was not optimal. I had ordered food and was told I would get it within 1/2 hour (it was a salad) and I got it after 45mins. Normally this would not be a problem but I was running late. I also asked them to clear up the food when I was gone and no one did so. Again, these are minor things and would not prevent me from staying at the property. Staffs are so supportive and friendly!